One of the most important aspects of bringing power to any electrical installation is having solid connections. Even with the best of designs, if the electrical connections don’t hold up over time, you are going to be faced with a serious problem. What makes this seemingly simple part of the installation so prone to difficulty? It boils down to two things: ensuring proper connections at the time of installation, and ensuring those connections remain secure over time – which can be more challenging than you might first think. Power equipment, such as circuit breakers, frequently is designed with screw connections to allow a good, tight field connection. Such equipment always includes manufacturer specifications for the torque required to make solid connections. Installers know these specifications, but sometimes find it inconvenient to be as meticulous about the installation as they should be. For example, when an installer is putting in a mixture of small equipment and large units, he or she might be tempted to use the same set of tools for both. In that case, the likelihood goes up that the connections on the smaller equipment will be overtorqued, or on the larger equipment, undertorqued. Overtightening can introduce cracks, strip threads, and otherwise lay the groundwork for future problems. Similarly, undertightening increases the resistance to the electrical flow and opens the door for the cables to quickly oxidize and build up additional unanticipated resistance – which means they may soon begin to overheat. One common way to apply the correct torque is by using a calibrated torque wrench along with correct bits. However, that requires periodic maintenance and we all know how that sometimes can be overlooked. 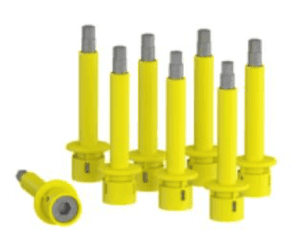 Knowing that proper installation presents an ongoing challenge, Schneider Electric developed a torque limiting breakaway bit for some of its product lines. This tool eliminates the need for a calibrated torque wrench while still ensuring proper tightening of the cable connections. But the fact is, properly tightening the connection is only the first step. Yes, it helps prevent oxidation of the conductor, regardless of whether it is copper or aluminum, by starting out with as full contact between the contacts and the cable as possible. But over time, cables are subject to creep—they slowly reconfigure their cross sections over time in reaction to the initial connection pressure. Ordinarily that results in decreased connection pressure, which can lead to oxidation, which in turn increases the electrical resistance of the connection, which begins to build up heat. The thermal effects of heating and cooling that occur as the current flow in the cable increases and decreases further accelerate the creep, and the connection loosens. To combat this inevitable loosening, Schneider Electric developed a creep compensating technology called EverLink™, which has been incorporated into several of its circuit breaker product lines. EverLink introduces a spring element into the connection that maintains the proper connection pressure for years despite creep in the cable and the ordinary thermal stresses created by current flow. 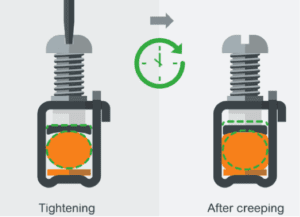 After the initial installation, for which proper torque has been confirmed using the breakaway bit (or another suitable method of confirming torque), the spring element ensures that no loosening of the connection occurs over time. Watch this two-minute video to see how a breakaway bit is used to ensure good power connections. Our next post in this series will explain the importance of maintaining this long-term contact integrity. Simplify Power Distribution While Improving Reliability: Go Modular Executing the 3 Key Steps for Improving Machine Builder Efficiency Improving Power Grid Reliability and Operational Efficiency Shore connection : how to make a ship ready?